Plummer Block assemblies are available for heavy duty applications and where replacement is difficult, such as with long shafts or shafts with tight-fitting components outside the bearing. The bearing housing is split into two halves so the top can be removed and assembled without disturbing other components on the shaft. Plummer block housings can be used with high-capacity spherical roller bearings or self-aligning single row or double row ball bearings. 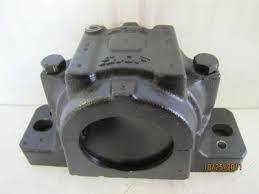 They are manufactured from high-strength cast iron as standard. The housings have a re-lubrication facility and can be used with either oil or grease lubrication.